I figured that since it’s my birthday this weekend, it should be a long weekend taking today and tomorrow off work just to relax, play, and do anything but think of work. 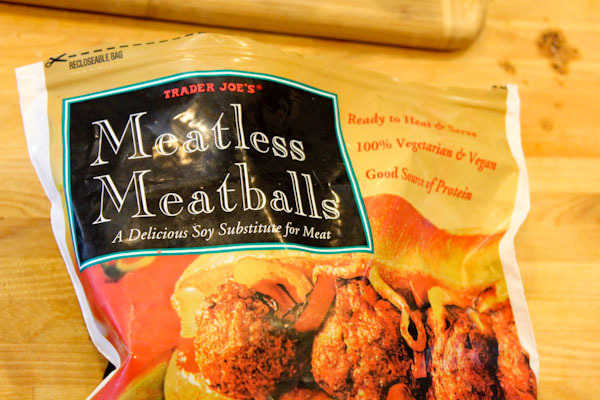 I started my laid back celebration last night with a simple dinner using Trader Joe’s vegan Meatless Meatballs, a total lazy crutch freezer food, I know. I grabbed them for a simple dinner emergency after a busy day and as something I could share with non-vegan hubby. 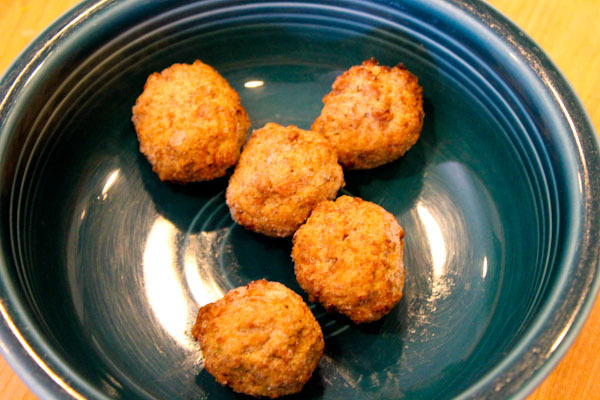 Out of the bag, they look eerily like actual meatballs, but the texture and flavor is not, more like a lighter bean ball that happens to pack as much protein per serving as hubby’s frozen turkey meatballs. 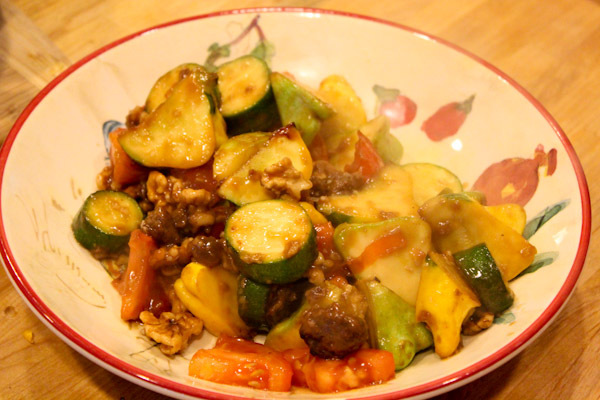 I crumpled them into a simple ginger stir fry with summer squash, tomatoes, and walnuts and it was a delicious combo! 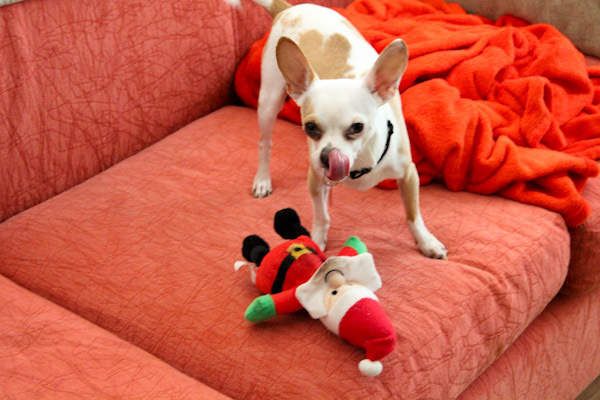 This morning I had a leisurely morning playing with this little guy. 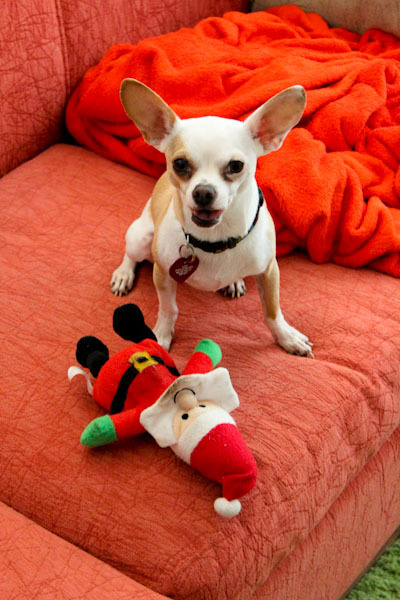 Who’s already trashed his Santa toy. 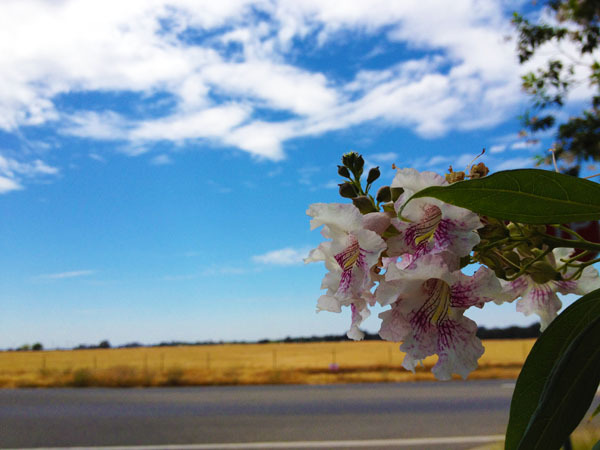 And went for a lovely 3-mile run in perfect weather – cool, overcast, breezy and a slight sprinkle of rain. But an IT Professional is always working in a way, later in the day I headed over to my mom’s new condo to hook up her DSL and electronics. 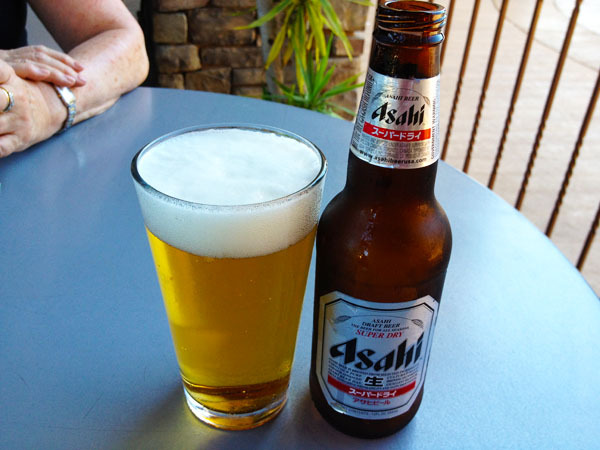 Then she treated me to a laid back dinner on the patio of one of my favorite Japanese restaurants and one of my favorite beers. 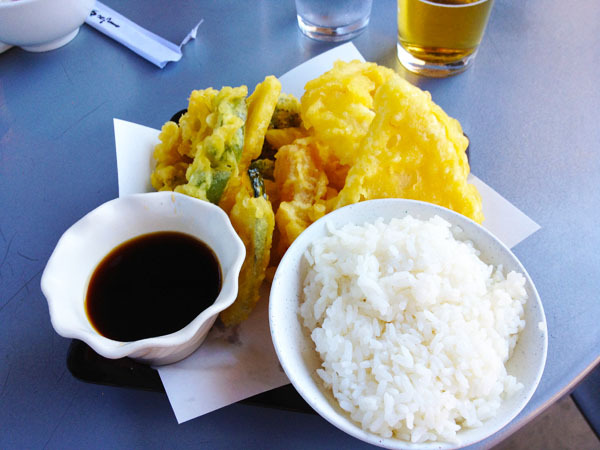 And to another total splurge dinner of vegetable tempura. Wow is it a greasy comfort food! I can only get through about two pieces before I have to start picking off the fried outer shell. But still simple and tasty. Finally I wrapped up my chill day off with a trip to our local farmer’s market. I adore farmer’s markets and feel bad about not being able to go to this one enough because of my work schedule. 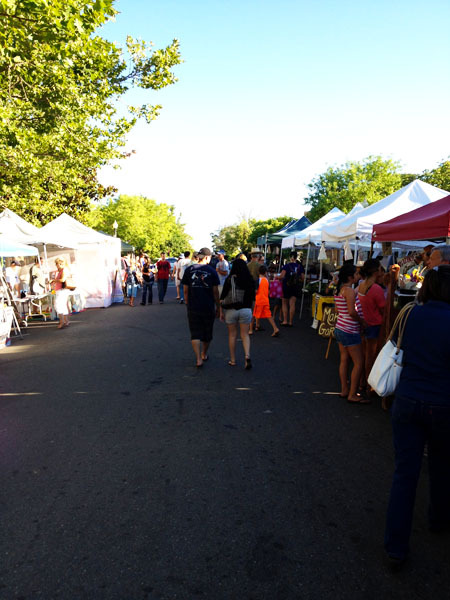 I dream of being able to leisurely stroll farmer’s markets every day buying fresh stuff for the day, I need to keep adding to our early retirement fund so I have time! 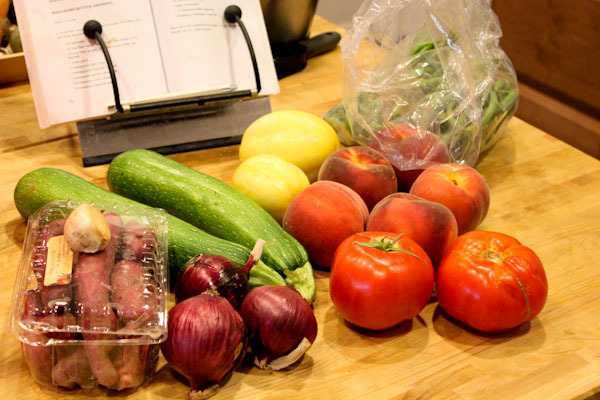 For about $20, I scored a lot of fruits and veggies including two monster zucchinis to spiral slice, local potatoes, peaches, and green beans. 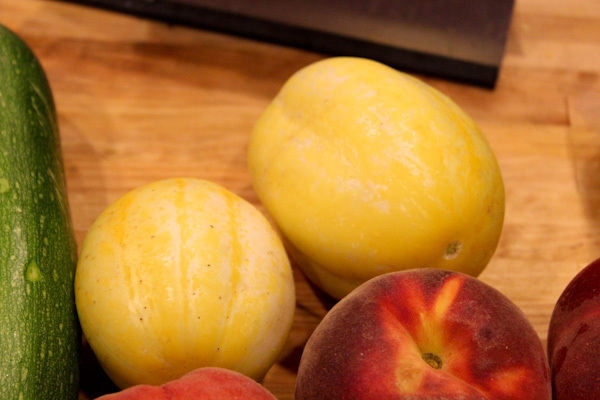 Also these fun lemon cucumbers I adore but never see at Trader Joe’s. So true on TJ’s and so many new products every time I go it seems. Happy birthday, and enjoy the rest of your long weekend! Thanks, hope you have a wonderful weekend! Hope you have a great long birthday weekend, Christine! You deserve it. Here’s to more leisurely farmer’s market trips in future years!